One of the pervasive folk legends about finding directions in the wilderness or woods, is that moss grows on a certain side of a tree or rock. Just find your way by observing where the moss is, according to this theory, and you won’t get lost. Well, I checked this myth out, and here is what I found. According to this traditional old “wisdom” the moss is thickest on the north side of a tree in the northern hemisphere. In the southern hemisphere, the moss is thickest on the south side. Subsequently, this survival tip will help you to find your way in a forest. But the newspaper guy in me had to ask: What direction does the moss point? Is there a difference in the location of the forest and the way the moss points? What are the variations? Why? Where did this legend come from? The basis for this directional moss idea may have come from general information about moss. Moss produces spores instead of seeds, and it needs a damp environment to reproduce. 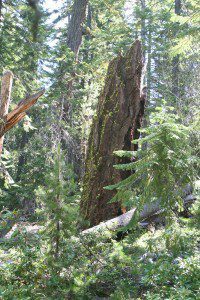 Moss spores don’t survive in dry areas. The sun shines from the south in the northern hemisphere, so a tree’s north side is generally more shaded and damp. It stands to reason that there would be more moss on the damp – the north – side. The moss myth never got far with me. In the dense, deciduous forests of Mississippi where I used to hunt and ramble, I could never find any pattern for the moss. In any dense, thick forest – where the sun doesn’t penetrate as far – it seems like you’ll see mosses on all sides of the trees. In some of standing water swamp areas where I used to wader-hunt for ducks, the moss was everywhere. It sometimes varied because of the fluctuating water levels! 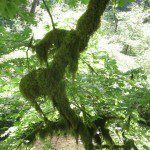 Moss grows everywhere in this temperate rain forest in Oregon. moss on the north side of rocks in an open area, but in a shaded forest, chances are good that the rocks will be completely covered. There are apparently so many variables about where and when moss grows in a forest that a firm rule can’t be established. I couldn’t find a consistent pattern anywhere. In one area, the moss grew on the west side of the trees, because there had been some timbering going on that let in more sunlight. A short distance away, the trees and underbrush were so dense that moss was everywhere. 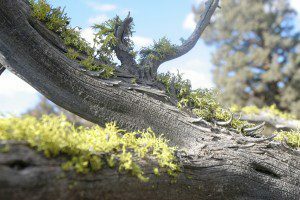 The lichen on this dead juniper tree in the desert grew on the top! One of my requirements for a wilderness survival tip is consistency. The skill or technique must work every time, because there is no room for error when it comes to survival. Don’t depend on finding your way, based on directions gotten from the moss on trees. This idea is NOT something to promote or rely on. Subsequently, I dub direction finding by observing moss growth a myth. And I proclaim that myth busted! This is the birthday of newsreel journalist/narrator Lowell Thomas.